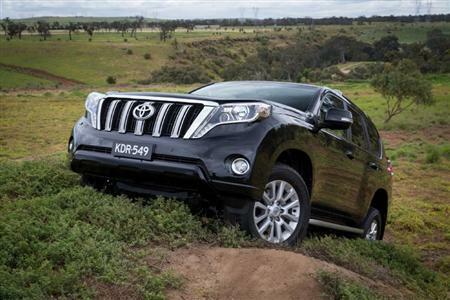 Toyota recently upgraded its Land Cruiser Prado with bolder exterior styling, a more refined interior and even better handling for the 2014 model year. Exterior changes are led by a distinctive redesign with a deeper front bumper, heritage-inspired grille and newly styled alloy wheels that reinforce the Toyota 4x4's toughness, reliability and renowned off-road abilities. Interiors have benefited from comprehensive upgrades that raise quality, convenience and ease of use with new multi-media audio systems, a redesigned dashboard and new materials, detailing and features. Refinements to the standard suspension and the electronically modulated Kinetic Dynamic Suspension System have improved handling and ride comfort. Toyota has further developed functions that provide driver guidance and technical support, ensuring maximum precision and control for negotiating obstacles as well as more intuitive controls for on and off-road systems. It has extended safety features to include trailer sway control, a system that assists the driver if a towed vehicle is unsettled by factors such as crosswinds or bumpy roads. Seven airbags, a rear-view camera and stability and traction control are standard across the range, as is an emergency brake signal that automatically flashes the stop lights to warn other drivers of potential danger. Despite the advances in styling and features, the entry price for Prado has been kept at $55,990* and increases across the rest of the range average less than 1.2 per cent. 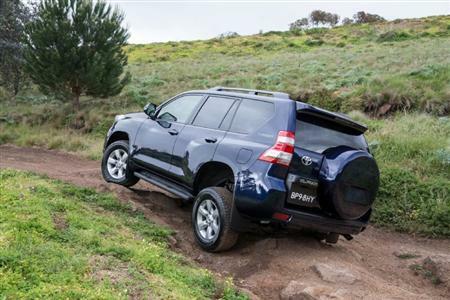 Toyota Australia executive director sales and marketing Tony Cramb said the upgrades will confirm Land Cruiser Prado as one of the most technically advanced and easy-to-use 4WD vehicles in the world. 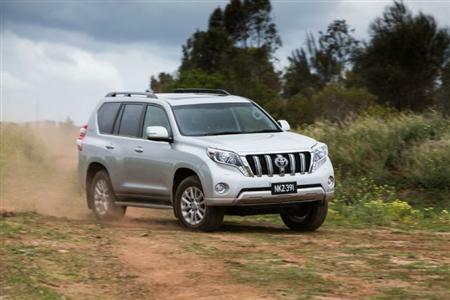 "Land Cruiser Prado has become an icon in the 4WD market for its blend of rugged performance and premium features," Mr Cramb said. "The latest improvements will enhance Prado's rock-solid reputation as one of the world's toughest and most reliable 4x4s while offering the style, comfort and on-road performance that are important to customers," he said. "Prado's off-road performance and on-road dynamics, its powerful road presence, enhanced ride quality and high levels of technology distinguish it as an ideal blend of go-anywhere capability, comfort and refinement." In ascending order, the five-door Prado range is GX (a five-seater with a seven-seat option) and the seven-seat GXL, VX and Kakadu. Three-door models have been discontinued. Prado's styling make-over features a newly designed radiator grille with five prominent horizontal bars. It is integrated with new headlamp clusters to provide a more powerful-looking structure that has been placed higher to afford added component protection during off-road driving. External measurements and approach, departure and ramp-over angles are unchanged, safeguarding Prado's excellent agility, manoeuvrability and off-road prowess. The vehicle profile is enhanced by newly designed 17-inch six-spoke and 18-inch 12-spoke alloy wheels. There are two new exterior colours - Dynamic Blue, a dark blue mica paint, and the mica metallic Liquid Bronze. 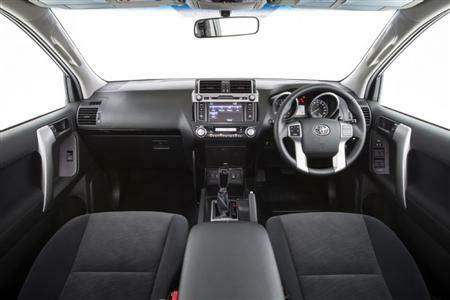 Inside, Toyota has revised interior trims and ornamentation to make a more elegant atmosphere with touches such as double stitching for better appeal and even higher perceived quality. The forward-folding angle of the second-row seats has been increased by more than 12 degrees, improving ease of entry and exit for third-row occupants. VX and Kakadu's second-row outboard seats can be heated independently. The revised driver's instrument binnacle incorporates new tachometer and speedometer dials - Optitron for VX and Kakadu. Between the Optitron dials is a new 4.2-inch colour TFT multi-information display (MID) that provides significantly enhanced off-road driving assistance. New information regarding individual wheel traction control, steering angle and differential lock operation can be displayed simultaneously for maximum driver assistance in challenging terrain. On top-level Kakadu, Multi-Terrain Select - which gives drivers suitable guidance while automatically controlling power output and braking inputs - is now operated by a dial. A fifth mode, to help negotiate rocks and dirt, has been added to the previous rock, loose rock, mud and sand, and moguls modes. 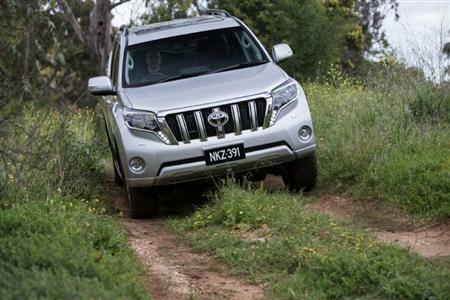 Proven engine choices for Land Cruiser Prado are the 127kW 3.0-litre turbo-diesel engine or the 202kW V6 petrol engine with variable valve timing on the inlet and exhaust valves. The four-cylinder, 16-valve diesel - with 410Nm of torque on tap from 1,600 to 2,800rpm - is available across the r ange. GX and GXL grades offer the choice of a six-speed manual gearbox or a five-speed electronically controlled automatic transmission. 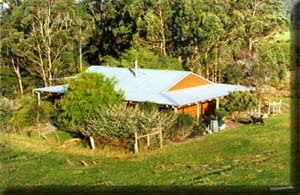 Diesel VX and Kakadu grades are fitted exclusively with the auto. GXL, VX and Kakadu are available with the 24-valve, double overhead cam petrol six and the five-speed automatic transmission. Option: Metallic/pearl paint $475* (no price change). • maximum 2,500kg towing capacity (with appropriate non-standard equipment). Automatic Prado GX has the added features of Hill-Start Assist Control (HAC) and Downhill Assist Control (DAC), while an option pack adds third-row seats and extends the side-curtain SRS airbags to the third row. • heated and power-retractable exterior mirrors. • full-colour multi-information display with steering wheel switch. • key-linked driver's seat and steering column two-position memory pack. Kakadu also has Pre-Crash Safety System and radar cruise control, with steering wheel-mounted controls. Not all 'devices' will be compatible with the standard equipment and functionality varies depending on the device and location.